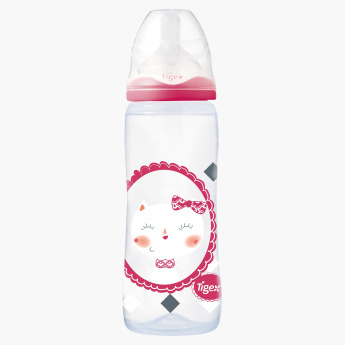 Tigex Printed Feeding Bottle - 360 ml | Pink | Wide neck bottles helps baby easy to latch-on. Pick this adorably printed bottle for your little princess and help her for a smooth transition from nursing to feeding bottle. It features a wide neck that helps baby to easily latch-on and the fine material makes it easy to clean and maintain. Feature 1 : Wide neck bottles helps baby easy to latch-on.